Inspiration for Scenic Route Paper Co. papers and products just goes on and on in this post as we produce some fabulous examples from our own design team as well as sourcing outstanding work from the online scrapping world. 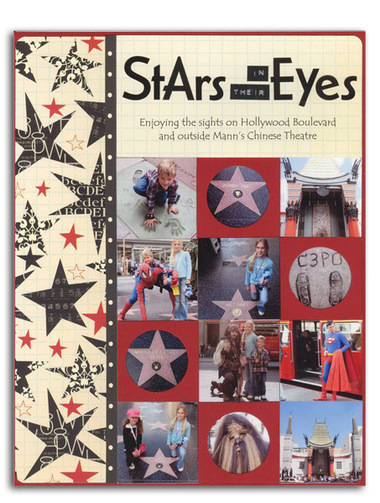 Stars in their Eyes by Caroline McLachlan. These new papers from the Laurel/Savannah range are perfect to showcase photos from Caz’s recent USA holiday. She organised a tour of Los Angeles and Hollywood in particular so her girls could see the place so often mentioned in American movies and TV shows. 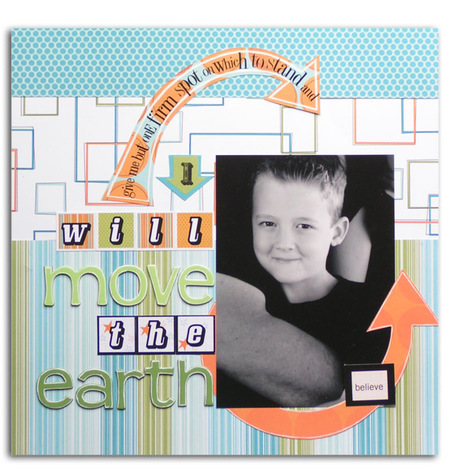 Caz made her own cardstock circle slide frames to highlight the smaller photos on her layout. Perfection by Nic Howard. Just about everything you see here is made by Scenic Route. From the bright border, to the light papers under the journaling, the bright flower on Kraft cardstock and even the black chipboard letters. Nic has used papers from both Metropolis and Laurel, showing that the different lines of papers are easily mixed and matched. The Berkely letters have quickly become a favourite of Nic's, and she has finished off the detailing in the layout with another current favourite; Queen & Co Beadifuls. Move the Earth by Susan Doyle. Suz fell in love with this photo taken by Raylene Wilkinson of Alexander Finlayson. There was something about his dad's forearm wrapped around him and some quiet confidence in his eyes that draws you in, and an old favourite quote seemed perfect. 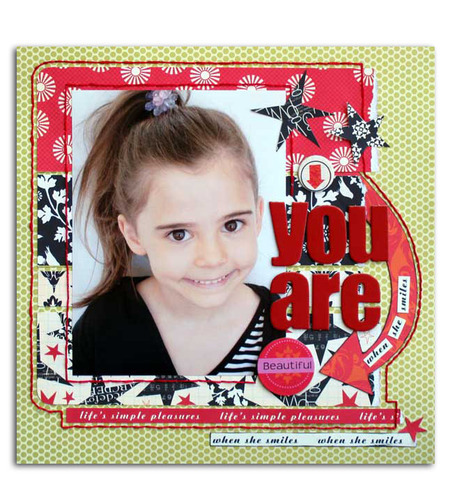 Suz has used the new Metropolis papers, die cuts and alpha stickers, as well as some good old Redmond chipboard. 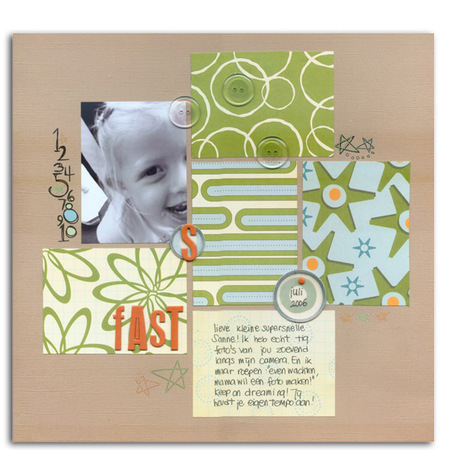 In this layout Mel selected the new range of Scenic Route Laurel papers, scrap strips, arrows and chipboard pieces. By combining products from the same range she has put together a striking page relatively quickly which left time to handstitch the border that she wanted to create around the photo and outside edges. Growing Beauty by Caro Huot, Quebec, Canada. It was the bright colour and fun texture in this layout that first caught our attention. 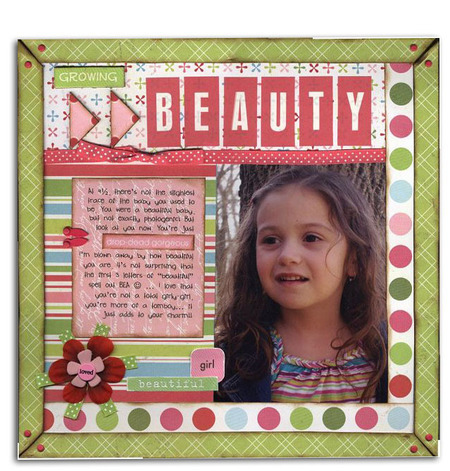 From the chipboard frame to the Scenic Route chipboard photo corner arrows, to the layered flower, Caro has used the Brighton Range from Scenic Route for the majority of this layout- and it matches her daughter's shirt perfectly! 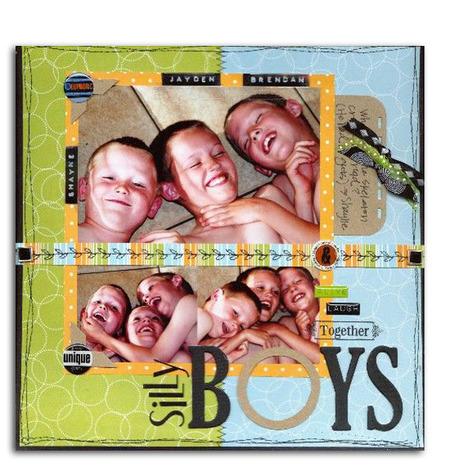 Silly Boys by Shaunte Wadley of Lehi, UT, USA. We loved this feel-good layout as soon as we saw it. Several papers from the Scenic Route North Shore range, paired with some Pressed Petals Chip Chatter alpha's makes a fun layout -with fun sentiment. Be by Revlie Schuit of Roelofarendsveen, Netherlands. Scenic Route papers are so versatile, this layout showing just how even the bold papers of the CapeTown range can be used in a feminine way. A little Scenic Route chipboard lettering and a quote finish this layout off nicely. Fast by Revlie Schuit of Roelofarendsveen, Netherlands. Revlie's layout is a great example of simple being perfect. 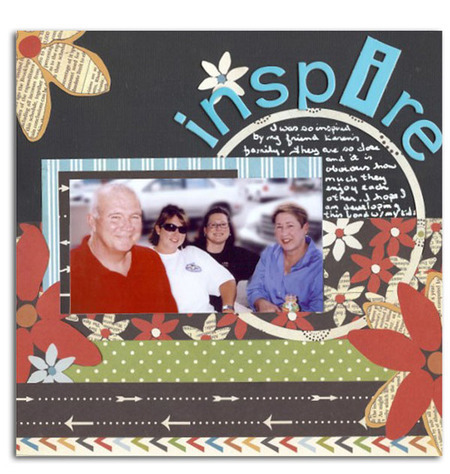 Several different papers from the Scenic Route Hampton range cut into similar size rectangles, arranged in the middle of the layout, add a photo and some Heidi Swapp lettering and the story is told. Observe by Gigi Kennedy. We were enchanted by the charm and movement of this layout. Gigi has simply used stars from a few different Scenic Route Paper ranges as her only embellishment on this page, enhanced by some quick outlining doodling - and how cool is her handwriting?! Baby It’s Cold Outside by Jael Calville. 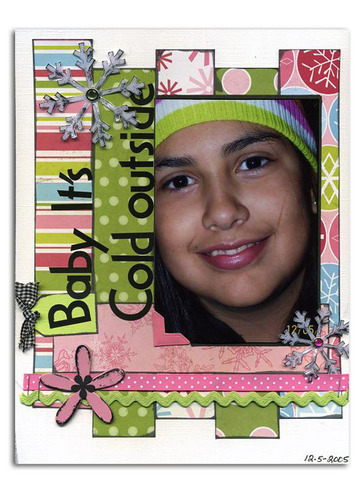 Jael has used layered strips of the Brighton range of Scenic Route papers to create this funky photo mat for her picture. She has inked the edges to give the strips more definition. This technique is a great way to use up scraps of patterned paper. Inspire by Terri Hayes. Terri demonstrates another great use of strips of paper in her tribute layout to a friend’s family. She has used strips of papers from the Capetown range, and also cut out individual flowers from some of the papers to use as accents. 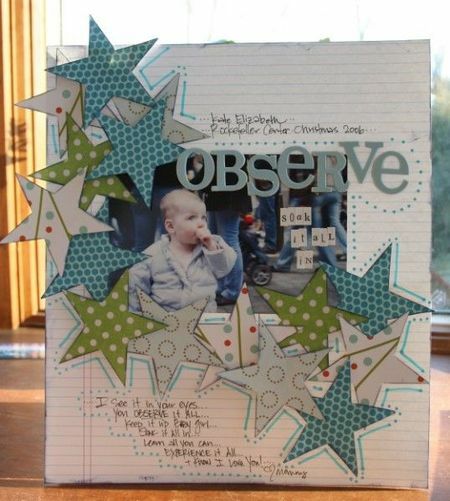 The journaling box is created with a thin circle of paper, circles being all the rage at the moment, and her title using the Redmond Chipboard Stencil letters, wraps around it.